LAS VEGAS – The action at the Bullfighters Only Las Vegas Championship was wild, electric and dangerous Thursday at the Hard Rock Hotel & Casino. Four men advanced to Saturday’s finale, three more will move on to Friday’s Wildcard and one man was injured and could not finish his fight. When the smoke cleared, Beau Schueth posted the highest-marked fight of the day with an 88.5-point bout to advance past Cody Emerson, who had an 86. “All this summer I’ve seen that bull go, and I knew he was really hot,” Schueth said of 12X and Costa Fighting Bulls’ Bad Intentions. “I’ve wanted to fight him, and luckily I drew him today. I started with a fake, and he bit on it. But that bull could switch around fast, and he was back on me. He will be joined in Saturday’s round by Tanner Zarnestski, Schell Apple and Travis Gidley. Zarnetski posted an 83.5 to upend Toby Inman’s 81, and Apple was 81 to slide past Ross Johnson’s 80. When Ross Hill suffered a serious knee injury early in his bout and was unable to finish, Travis Gidley advanced with a 76.5. While the four winners move on to Saturday, the others will battle back during the Wildcard. Eight men will fight for one spot in the championship round. Both performances begin at 11 a.m. at the Hard Rock Hotel & Casino, and follow-up shows that feature the Bullfighters Only “Sessions” will begin at 1:30 p.m. Friday and Saturday. Tickets for the final two days of the BFO Las Vegas Championship are on sale at www.HardRockHotel.com and AXS.com. Eight men will battle in the Wildcard. It will feature two four-man rounds, and the winners will then square off against each other. The winner will advance to the championship round and be part of a nine-man field, which will feature three rounds of three competitors. The top three will advance to the short round, and the top scorer in the final round will earn the BFO Las Vegas Championship belt. “It’s amazing for a big hotel like the Hard Rock Hotel & Casino to back us like this and to set up a place on their property,” Schueth said. “It’s probably one of the funnest bullfights I’ve been to up to date. Everybody pulled out the stops for this deal. His score on Thursday proved how much Schueth wants to take the title. It tied for the highest-marked fight of the first round, matching one exhibited by Weston Rutkowski on Wednesday. “This is definitely a boost of confidence from how I did last week during the Roughy Cup,” said Schueth, who had a rough run of things in the opening round last Thursday. 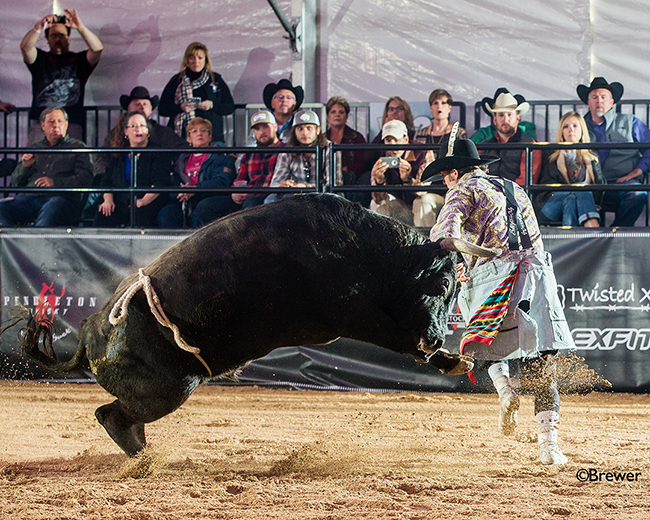 “To get around a bull like this is huge, but at the same time, you have to let go and focus on the next one. It’s going to be a totally different fight, because no two bulls are the same.